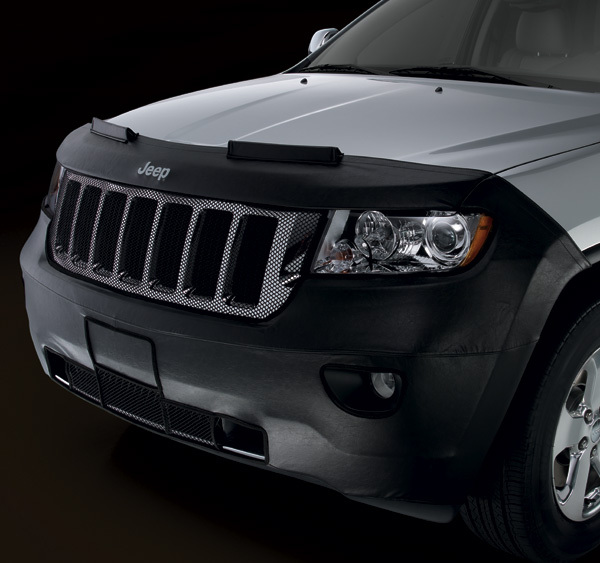 Dirt, dust and pesky insects can do a number on the front end of your Jeep Grand Cherokee if you don't take care to keep it protected. Make sure you do by covering it up with the Front End Cover by Mopar, available at JustforJeeps.com. The Front End Cover 82212083 is constructed in two pieces, so you can open the hood without removing the cover to do so. The front end cover, made of black vinyl with a mesh bug screen, won't do any harm to the painted surface that it was made to protect in the first place. Does not fit Summit, High Altitude, SRT8 or 75th Anniversary models. Trip is 4,000 miles in route now...cleans up well on the fly. Holding up to 80 mph in SD, WY, CO & KS and eventually back to IL. Looks great and fits excellent, ive been asked where did I get it at parking lots, you should have a referral bonus program :) Liked you didnt use cheap plastic at all. Instructions are clear and easy to follow. The only downer is that you have to remove it every rain and stumble it to dry. You should add it to the description. ProsVery good quality of material, doesnt feel cheap. fits great, easy to install. ConsYou should add its not rain/weather proof, I have to keep removing it every rain we get. I love the front end cover. My only complaint is that the tabs that fit between the grill and the headlights are continually needing to be re-tucked back in. They just won't stay in place. Other than that I'm very happy with the cover. ProsGood fit overall and looks great. Provides lots of surface cover. ConsTabs don't stay in place at grill and headlights.